3 bedrooms, 3 ensuite bathrooms, sleeps 6. Special rates for smaller parties. Built 200 years ago during the days of grand sugar plantations, Vervain Mill is a step out of the ordinary. Located on the southeast side of the island, part way up the hill toward Mt. Nevis where ocean breezes cool and refresh, Vervain Mill offers three bedrooms, three baths, beautiful furnishings, swimming pool, gazebo, architectural ruins, sweeping views of ocean and mountain, and lots of privacy. Graduated rental rate schedule to make the mill more affordable for smaller travel parties. Regardless of number of people, the whole property is available. Beautiful Mt. Nevis rises in the distance with clouds brushing the top. Sweeping views of the Atlantic with views of Montserrat and Antigua. Dining indoors or out on the wrap-around terrace. Children under 13 not allowed due to open stairs and unfenced pool. Smoking outdoors only. This was an amazing property! If you are looking for something different and unique, this is the place. This wonderful home has 4 levels: bottom floor is 2 bedroom areas, 2 full baths plus laundry room; second level is the kitchen/dining area with a separate space for the fridge & pantry (Great views & trade winds from the kitchen window!) ; third level is another bedroom with a unique panoramic view & full bath; and the top floor is a lovely little sitting room with views all around and a balcony that offers fantastic views of the Atlantic, Antigua & Monserrat (on clear days) and stargazing that is beyond words! You will also see cruise boats traveling in the distance to & from Antigua at night. Make use of the binoculars! We slept on the ground floor, in my opinion, the best for enjoying the winds & nature sounds while you sleep. The African Vervet Monkeys are in the yard every morning & evening but prove shy to capture on camera. They are fun to watch though. Always have a cup of coffee or tea on the veranda in the mornings! (And a beer or cocktail in the evenings) There was a donkey & her baby that kept getting into the yard while we were there & would come up right outside our door at night. Lovely landscaping, though I think the gardener hasn't been keeping up as well as he should. Be warned, the beds are Very firm so if you aren't used to sleeping on box springs you may not rest very well. The pool is just right for a cool dip and some relaxing in the sun. The outdoor furniture is still in good shape, but could use updating. And you will get sunburned so use sunscreen. We spent 10 wonderful days here and it was just what we were hoping for. Very quiet & low-key island. All of the people are just so friendly & helpful. There are SO many great places to eat or the kitchen is great if you prefer to cook your own meals. **Read the guest books for helpful information from previous visitors. Don't be shocked by the street that leads down to the house, first impressions would make you miss out on a most memorable experience.Overall, this property could use with a few updates but is very clean and cozy and we would definitely recommend it to anyone especially if this is your first visit to the island. We hope that we can return here in the future. Vervain Mill is a very special place! It’s private, beautiful, gorgeous views, lovely island. We had a wonderful time- loved the night sounds of frogs and donkeys-yes donkeys! Kay managed all the logistics beautifully for us. Thank you for sharing this beautiful place! We came to Vervain Mill on a family vacation to celebrate Thanksgiving. It was our first time in Nevis and Kay was incredibly helpful in arranging our transportation and answering all of our questions before and during our stay. The mill looks exactly like it does in the photos (beautiful); it was nice to fall asleep in the evenings to the chorus of wildlife outside (I think they were tree frogs?) and I definitely got a good workout going up and down the stairs inside the mill -- what a stunning view from the top floor! I would recommend renting a car to explore the island, and getting some bug spray (but I'm also extra sensitive to mosquitoes, especially when they come out in the evenings). Thank you, Kay and Wendy, for making our trip in Nevis so memorable! Super place to stay if you are looking to experience life like never before lived. The renovation of this historic mill is superb with all the comforts of home, and then some. We're really glad you enjoyed your stay and hope to have you back again! 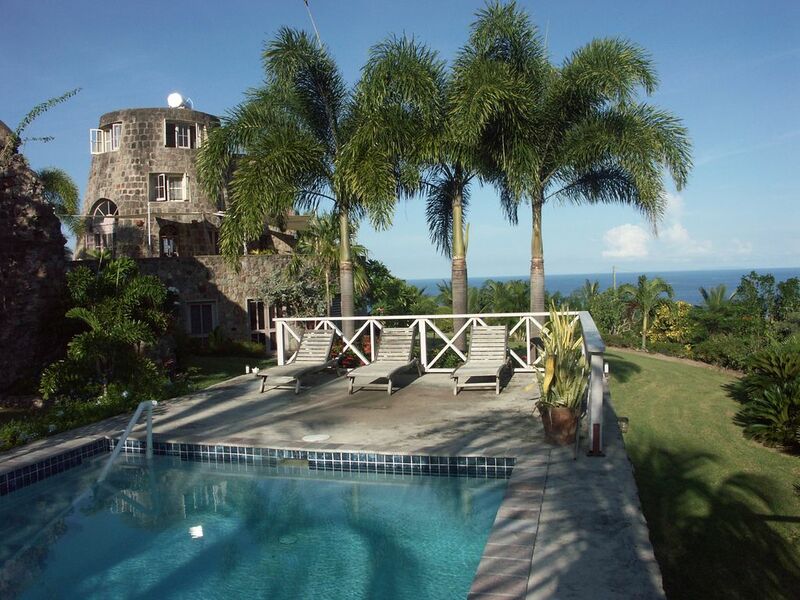 all the best, Wendy T.
Located on the southeast side of Nevis, partway up the mountain, with sweeping views and refreshing breezes. Nearby are beaches, hiking, and charming colonial inns for dining out.